Everything you need to start an archery program for 8 to 10 year olds! Everything you need to start an archery program for 8 to 10 year olds in one easy-to-order pack. 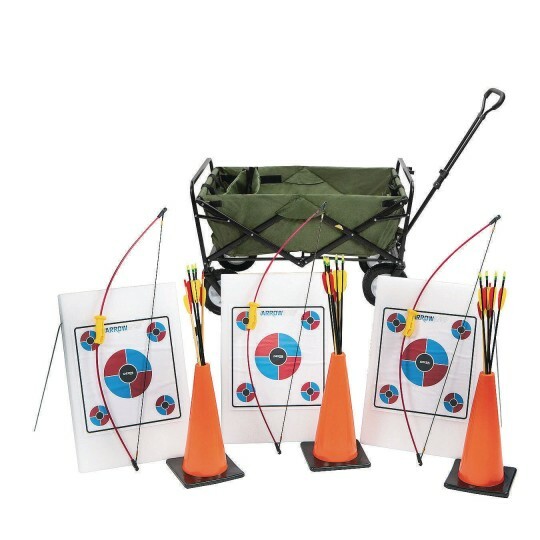 Includes 3 Wizard 44” bows with 10-18 pound draw weight and 17-24” draw length, 3 self-standing foam targets (24” x 16”), 18 arrows, 3 polycones to use as arrow holders, 3 arm guards, 3 marshall tabs, and a convenient utility cart to move everything around in. Bows are universal fit and can be shot by left or right-handed shooters.